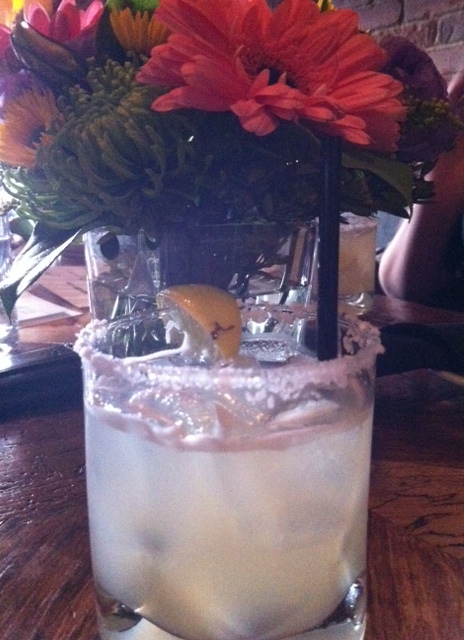 I am always on the hunt for a good margarita, which is why I love Anejo. Calgary’s new-ish Mexican restaurant (#2, 2116 – 4 St. S.W.) is a stylish taqueria that claims to have the best margaritas in YYC. Take it from me: they are good. Now, imagine your favourite classic marg with a kick — and a whisper of coconut — and you’ve got yourself a coconut-chili margarita. This amazing creation has been margarita-of-the-month at Anejo all March so if you want to try one there — tick-tock — you’d better hurry. I was able to sample this zesty and tropical twist on my go-to summer sip last week during a lovely media dinner hosted by Tourism Victoria. Doesn’t my cocktail look fetching in front of the beautiful flower arrangement shipped in from Victoria? This drink is awesome and I love that it’s rimmed with coconut flakes! The only drawback is the tiny rocks glass it’s served in — you will be wishing for one of those fishbowl-sized Mexican margarita glasses! Rim a rocks glass with a mix of sugar and coconut flakes, then fill it with ice. In a shaker combine tequila, triple sec, lime and lemon juice, and coconut syrup, and then shake with ice. Strain into the rocks glass. This entry was posted in Cocktails and tagged Anejo cocktails, coconut-chili margarita, Drink of the Week, margarita recipe, tequila cocktails. Bookmark the permalink. Where do you find habanero coconut syrup? You have to make it. I can get the recipe from Anejo if you want. Email me at lisa.kadane@shaw.ca. Cheers! Hi Lisa…were you ever able to get the recipe for the habanero coconut syrup? Would you be willing to share? Yes–buy a bottle of coconut syrup from Cochrane Coffee, then infuse it with 2 scotch bonnet peppers, quartered. Taste periodically until desired spice level is reached. Cheers! I would say do it overnight (e.g. 8 hours), then sample. If not spicy enough, infuse longer. Hi Monika, you should be able to find coconut syrup somewhere (or google a recipe for it). Then infuse it overnight with 1-2 scotch bonnet peppers, quartered. Taste periodically until desired spice level is reached. Good luck!